Rivers State Governor, Chibuike Amaechi, has dared the state's governor-elect, Chief Nyesom Wike, to probe him to confirm if he was corrupt, adding that he ran a transparent and accountable administration and is not afraid of being probed by the incoming administration. 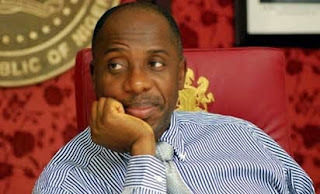 Amaechi spoke on Tuesday in Port Harcourt at the public lecture to mark his 50th birthday anniversary celebration. His said: “I have been listening to Mr. Nyesom Wike and I have been trying not to reply him. He has been accusing me of corruption and I have been trying to keep quiet over the issue of corruption. A thief cannot call me corrupt. The first lesson he needs to learn is that he was Chief of Staff to my government. If I have no records, I have records on him. “One way we succeeded in moving this state forward was that we refused to probe Dr. Peter Odili's government despite the pressure on me to probe Dr. Odili's government, because at the end of the day, they will not ask me the number of persons I probed, but what I did while in government. “God did not put me to shame. I will be leaving office as Rivers governor very proud. President Goodluck Jonathan and his wife (Dame Patience); Nyesom Wike, soldiers and police could not remove me from office. He said Wike’s comments that he would probe his (Amaechi’s) administration was a ploy to negotiate a soft-landing for the incoming administration. “Why Nyesom Wike is talking the way he is talking is that they are looking for us to come and negotiate with them so that they can illegally stay in office. They cannot stay like that. We are already in court (tribunal). “Why did they go to court to get an injunction against the panel we set up to investigate the deaths of Nigerians who were killed on election days? Why should Wike sponsor the court case? A judge gave them an ex parte order that the panel should not sit. “Luckily, we went to court and asked the court to vacate the order, to allow the members of the panel to sit. If you read the panel's report, you will cry for us,” he said. He expressed delight that the administration of President-elect Muhammadu Buhari would put an end to impunity in all sectors of the economy. Amaechi said: “One thing going for you is that the government of Gen. Buhari will not allow impunity anymore. A month to the general election, they arrested all prominent APC members in Rivers State. On the absence of a chief judge in the state and closure of the judiciary, he said: “They tried to appoint an administrative chief judge (Justice Daisy Okocha, who is very close to Wike) for the Rivers State judiciary. There is nothing like an administrative chief judge in Nigeria's Constitution. So you must be prepared; the fight/war is not over.